photo taken by Russian submersible MIR-2, courtesy of P.P. Shirshov Institute of Oceanology, Moscow. This is the first record of Phelliactis callicyclus since it was originally described in 1973. 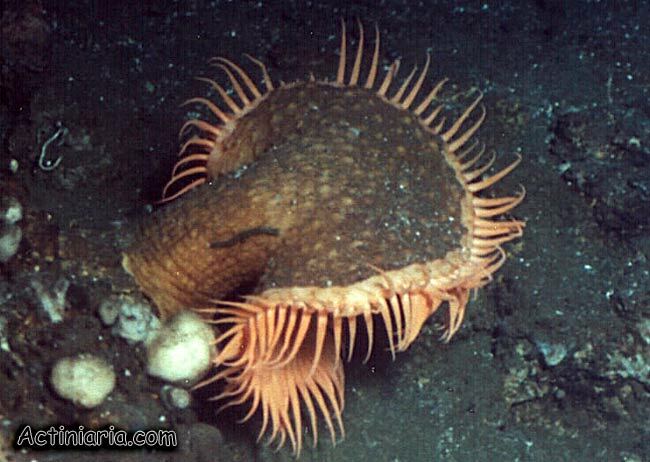 The genus Phelliactis contains large number of large robust deep-water sea anemones which appear to be rather common on deepwater abyssal plains. Surprisingly most species of Phelliactis and related Paraphelliactis are poorly documented and insufficiently described and many species in this genus are based on very few known specimens and the whole genus requires a revision.